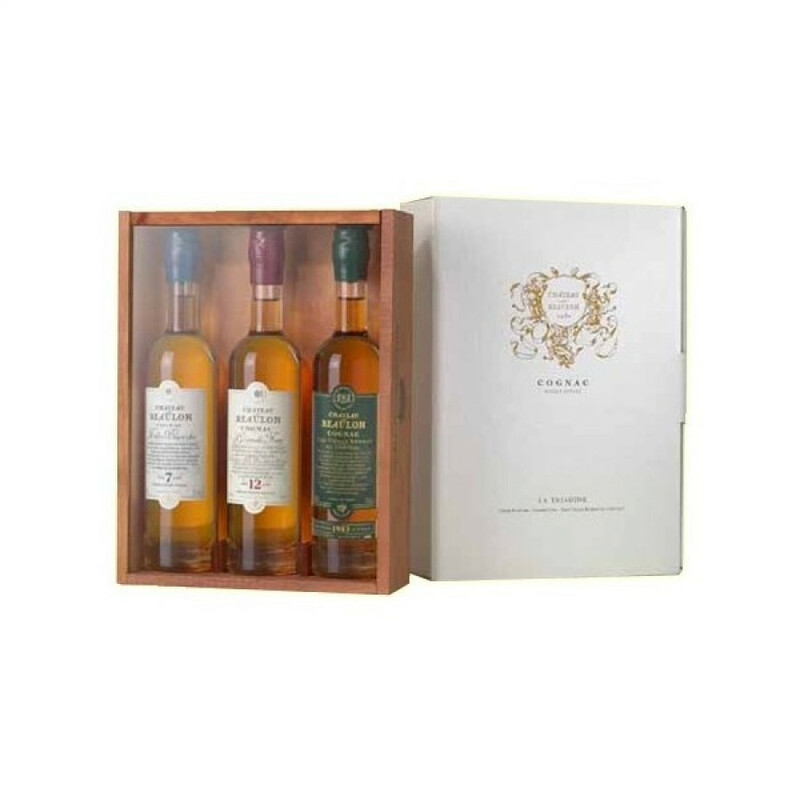 Chateau de Beaulon Triadine is a collection of three 20cl bottles of three of the houses cognacs - a great introduction to the taste of Chateau de Beaulon. The set comes in a lovely presentation case - making it an ideal choice for a gift for the cognac lover. As the name gives away, this is a Cognac that's been aged for seven years. It's a great example of an eaux-de-vie grown in the Fins Bois terroir, and that of the grape variety of Folle Blanche. A lovely warm Cognac, amber in color with glints of gold, its a fruity, well balanced, round Cognac that surprised with its maturity, despite its relatively youthful age. A deserving award winner, having been presented with the silver medal at the Mondial Brussels 2001, and the silver trophy at the Olympiades Vinexpo in the same year. A deliightful XO Cognac that's 12 years of age. Again from the Fins Bois terroir, this is a multi-award winning Cognac that is a great example of how good Chateau de Beaulon's offerings really are. It won the Excellence Trophy at the 2003 Olympiades Vinexpo, was rated in first place in a blind tasting by Wine Magazine, UK, and was stated as being 'perfection in its kind' by GaultMillau, and 'an elite eaux-de-vie' by Revue de Vin de France. This is a super example of how great an old vintage Cognac can be. The year 1983 was a harvest that has proven well worth such a product, and this Tres Vieille offering certainly won't disappoint. Enjoy in good company when you have plenty of time to savor.